Recently I was asked by Jon Haas of Warrior Fitness to be interviewed on his Warrior Podcast. So, we connected the other day and recorded the segment. I hope you enjoy the segment. Jon Haas is the owner and head trainer at Warrior Fitness Gym in Hainesport, NJ where he coaches men, women, and children in achieving high levels of fitness and mental toughness. He is a certified Underground Strength Coach and founder of Warrior Fitness Training Systems. He is a lifelong martial artist with over 30 years of experience and is currently ranked as a 9th dan black belt in Bujinkan Budo Taijutsu. Jon is the author of the book, Warrior Fitness: Conditioning for Martial Arts, as well as 4 other fitness related e-books. Jon maintains a very active blog on health, fitness, strength & conditioning, and martial arts over at www.warriorfitness.org. Jon is also a certified coach in VX Sport and is the Worldwide Strength & Conditioning Coach for VX Global. Growing up in the 70's and 80's was a fun and interesting time for a young man such as myself. Those times were heavily shaped by the Cold War and Post Vietnam. The theaters were full of post Vietnam movies like Sly's Rambo, Norris in Missing in Action (I - II & III), Francis Ford Coppola's Apocalypse Now, Oliver Stones Platoon and of course who could forget Stanley Kubrick's Full Metal Jacket. Post Nam hero's and plot lines also ran rampant on the TV as well with shows like Magnum P.I. (one of my personal favorites), The A-Team, Rip Tide etc. Along with the Nam Vet theme were also the anti-communist or more to the point, the anti Russian (U.S.S.R.) sentiment. This perspective was built out of decades of fear from the Cold War. This media also filled our bookstores, TV broadcasts and of course our theaters. 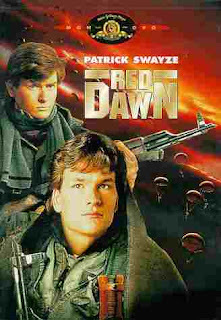 James Bond 007, Red Dawn and Rocky IV, War Games, Hunt for Red October, Firefox, Top Gun, etc. etc. typically pitted the good ole' USA against those commie pigs that wanted to rule the world, crush capitalism and personal freedom. Much could be written from both perspectives, however I am no political analyst. I am not claiming that the Soviet form of communist government is something that I am in support of. Nor am I supporting any other form of so called communist government as it is being served up by the Chinese or North Koreans. I am just sharing some general thoughts of my perspective and cause & effect. The Communist Manifesto written by Karl Marx and Friedrich Engels in 1848 was in response to what was happening in an era of industrialization where common working class people were being treated horribly. Through unmonitored and unregulated practices, most people were taken advantage of and quite frankly abused by rich industrialists. Monopolies, limited government intervention and greed kept class wars alive and well. The working poor were barely able to survive even with entire families working, subsistence wages were the norm as were the absence of any type of benefits which we consider normal today. Things such as minimum wage, child labor laws, workers compensation, unemployment and social security were still unheard of. Safety precautions for the workers was something that was rarely if ever considered because it added expense to the capitalists, not to mention it often slowed down manufacturing output. Marx saw what this industrialism was doing to people. He saw the slums, the horrible working conditions, the children workers, the poor families, the abuse. Click here for photographs He thought something should be done about it. He believed that something needed to change. Here is an interesting communist song written in 1871 by Eugène Pottier. Interesting choice of words calling for everyone to cut through racial, national and even gender barriers to unite as brothers and sisters for the purpose of fighting against exploitation and freedom for all. Isn't it interesting that a belief can unite us or rip us apart. We all need to be careful that our beliefs protect the Universal Life Value of everyone. Once that belief or value doesn't support all life we really need to reevaluate it to make sure it doesn't become the next justification for subjugating or even exterminating the life of another person or group. IMO true "communism" cannot be forced upon people. The idea of everyone working for the greater good, doing what they can and getting what they need is a great concept, but not if that ideal is forced on you. We are all motivated by many things in life and career; we all have different tolerances to what we deem as a reasonable way to live for ourselves and our family. Who is to say what's right for you is right for me as well, what motivates me (fulfillment & time to enjoy life) may not be what motivates another person (money and stuff). I am not here to dictate to anyone how to live their lives or choose their career, nor do I want someone telling me how to run mine. However, I don't demonize the idea of communism (socialism, Marxism) either. It was an idea from a man that was thought of in reaction to what was going on in the world around him at the time. In the meantime I will continue to enjoy watching re-runs of Magnum P.I. and reminiscing about my childhood reading Soldier of Fortune Magazine dressed in my camo ninja outfit watching the A-Team, enjoying my own skewed perspective. P.S. This post in no way reflects the opinions of anyone other than myself, however I wanted to give special thanks to Prof. Robert Hendershot Ph.D. for inspiring this post. Thanks for being such a great instructor. I've learned a lot from your classes.